Kolon Tissuegene is accelerating its advance into the U.S. to attain visible results within three years. 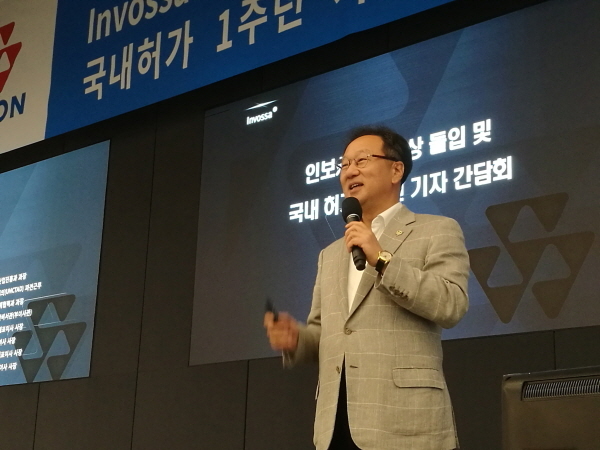 The company explained its business plan regarding Invossa-K’s entry in the U.S. market, holding a news conference at the Kolon One & Only Tower in Magok-dong, southwestern Seoul, Tuesday. Kolon Tissuegene CEO Lee Woo-suk explains his company's business plan during a news conference at the company headquarters in Magok-dong, Seoul, Tuesday. Invossa-K is the world's first osteoarthritic cell gene therapy developed by Kolon Tissuegene. The treatment injects normal allograft chondrocytes and cells with growth factors that expedite differentiation into the knee joint muscles to cure osteoarthritis. Domestic sales began last November after the company received sales approval from the Ministry of Food and Drug Safety in July. Like other generic drugs and biopharmaceutical products, the company is targeting the U.S. market. The company’s U.S. phase 3 clinical trial was on hold following the FDA's Clinical Hold policy. However, the FDA has recently lifted the temporary delay and allowed the company to run clinical trials on its drug. With the approval, Kolon Tissuegene plans to register the clinical institutions that will run trials on Invossa in the U.S. until September or October. The company also plans to apply for license approval in the fourth quarter of 2021 after going through a patient medication and observation period until August or September of 2021. Considering the period from the completion of phase 3 clinical trials and receiving sales approval for Invossa-K, the company expects to launch the product in the U.S. as early as 2022. The company has also established a global partnership for the phase 3 clinical trials. As contract research organization (CRO), the company has signed a contract with Parexel, while signing additional agreements with BICL and Imorphics for MRI and X-rays. Nordic Bioscience will be in charge of biomarker analysis and Cluepoints, and Medidata will establish the database for the research. The company has also designated 55 hospitals, including Johns Hopkins and Northwestern University Hospital, for their clinical trials while selecting 10 more hospitals as backup institutions. Invossa-K aims to cure osteoarthritis through its phase 3 clinical test fundamentally. The company selected its goal after the FDA recently redefined its disease-modifying osteoarthritis drugs (DMOAD) guideline. DMOAD refers to a therapeutic agent for osteoarthritis that is effective in relieving joint pain and improving function as well as inhibiting or restoring structural disease progression. “Invossa-K is highly likely to become fundamental care for osteoarthritis,” Kolon Tissuegene CEO Lee Woo-suk said. He based his optimistic outlook on sufficient statistical data (680 patients in the Invossa-K group and 340 patients in the placebo group), sufficient validation period (24 months), target patient optimization (K & L 2-3) and the introduction of an optimal validation technique. An additional sale of $2.2billion will also become possible if it gets further DMOAD approval, Lee noted, adding that the company plans to do its best to apply for sales approval by 2021.